Meet the founder of Satya Loka school, she is also the lead trainer and facilitator for the school’s teacher training courses and ongoing support and mentoring services. Radasi breaths, studies, teaches and loves her deepest passion, and that is to live a life immersed in Yoga, meditation,tantra, dance, devotion and ritual. Her earlier years set foundations to truly value life and from being a child there was always an inner calling to explore the more esoteric aspect to existence. She was introduced to Yoga twenty years ago while she was studying an Advanced Diploma in holistic counseling therapy. Since then she developed as a counseling therapist, a children’s teacher, Reiki ‘master’, and a teacher and facilitator of Yoga, Traditional Tantra, Sacred Dance and Hridaya meditation. 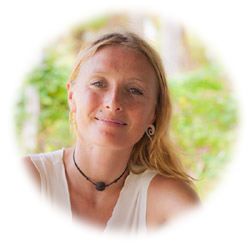 She has consistently accrued over 2200 hours in training, including ten years studying to become a teacher trainer in Tantra and Kundalini Yoga with Agama Yoga, and during a five year period she participated and later co ordinated ten day silent mediation retreats in Hridaya Yoga, the Path of the Heart which is inspired by Advaita Vedanta, Sufism, and Kashmir Shaivism, this led her to studying Hridaya’s first 500 hour Meditation & Hatha Yoga teacher training course. These retreats and trainings allowed her to directly experience a deep sense of inner silence and peace that lies beneath the fluctuations of the human mind. With her heart centred practice and the ever growing wisdom of balancing her own female and inner male energies her life is devoted to experience greater union and a recognition of the stillness that lies at the core of our being. She gives great gratitude to all of her past teachers, and to those who she has direct contact with in this present time, Guruji Maharaj, Sri Prem Baba and Sahajananada. She has also been guided by Amma and Sri Mooji as well as renowned shamans and spiritual teachers of this time. She feels a deep commitment to sharing traditional teachings to help others to recognise their true nature and to experience the beauty of life. At this time in her life she is closely connected to the direct guidance and Traditional Tantric teachings of Guruji Maharaj. She visits his home and temple a number of times each year to live directly in his presence and receives different sadhanas (spiritual practices) to learn how to embody and further teach a tradition of tantra that has kept its authenticity and ancient practices. During her life she has lived in spiritual communities and ashrams including various yoga communities, a women’s community in Avalon, and the Kriya yoga Ashram, to which she feels deeply connected to their linage master Sri Avatara Babaji. She spends each year travelling, teaching and living between India,Thailand, Russia and Europe, offering courses and various workshops, retreats and classes. She offers on going support to the participants and teachers that receive teachings Satya Loka school, and also offers personal tuition. When Radasi is not teaching she likes to spend time with her nieces and nephews and visits sacred sites through pilgrimages, she attends silent retreats and satsang, and practices daily sadhana (personal spiritual practice), which all support to enhance her service and the overall spiritual awakening. “Radasi embodies herself. This isn’t just her way of making a living, it IS her living. She teaches from doing not because she reads a lot but that her experiences put many of the philosophical questions into a real world, applicable context. Sharing how to actually create a life on this path rather than teaching out of a book.